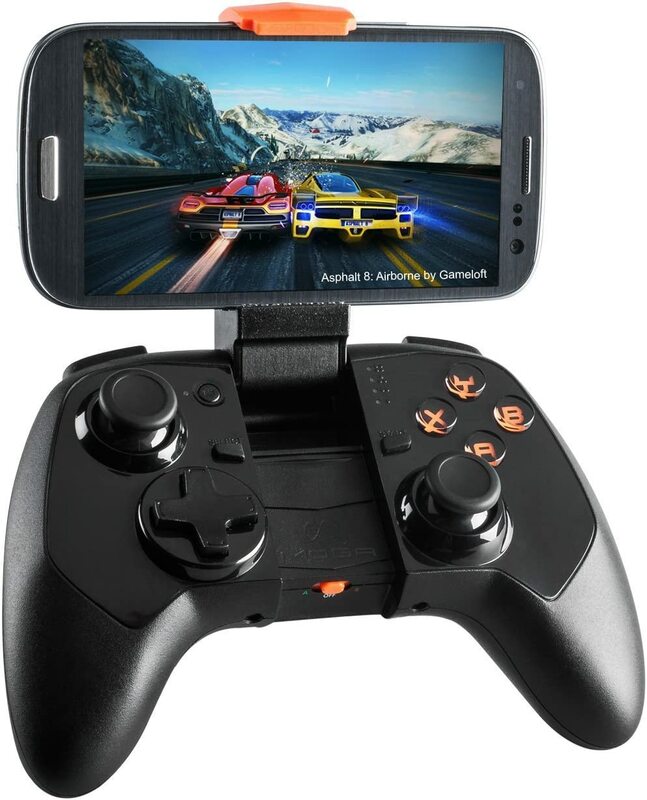 See Product Page for "Moga Pro Power Controller"
The MOGA PRO POWER Controller is a Bluetooth wireless controller for Android. It features a flip-up clip that holds phone of nearly any size. The front part of the controller folds out into an arm. This makes gaming on the go extremely convenient. The arm can fit a phone with a maximum width of 3.2" (82mm). Your phone will most probably fit in there even with a case on. The internal 2200mah battery of the MOGA Pro Power is capable of charging your phone via USB while playing. This will reduce the battery life of the controller, however it's a convenient option to have when gaming on the go. There is an internal 2200mah battery that can be charged through USB. You won't need to worry about having batteries on hand, or have the added cost of purchasing batteries for the controller. The MOGA Pro Power is a full sized controller, just like a PS3 or XBox gamepad. Most Android controllers are smaller, which makes them more cramped and uncomfortable for longer use. A larger controller fits your hands better, making it more comfortable. Since you can place your phone on the unfoldable arm, it helps balance the phone's weight better so it isn't as top-heavy. The analog sticks are on par with any top of class controller. They feel solid, comfortable and give you great control. It has both the MOGA profile and the generic HID profile for greater overall support. The older model of the MOGA Pro had rubber grips in the back, sadly they have been removed from the MOGA Pro Power controller. This makes the controller a bit more slippery. The controller is as large as a console controller. You need a bag to carry it, since it's too big to fit in your pocket. Users have reported that the controller sometimes disconnects when other bluetooth devices are active at the same time, or when playing for extended periods of time. ToughMarohu hasn’t added their experience, pros or cons to their recommendation. IngeniousEnten hasn’t added their experience, pros or cons to their recommendation. FlexiblePachaKamaq hasn’t added their experience, pros or cons to their recommendation. DignifiedSeker hasn’t added their experience, pros or cons to their recommendation. AgreeablePanacea hasn’t added their experience, pros or cons to their recommendation. Have a question about Moga Pro Power Controller? Leave a comment for Daniel, Dekthro and 17 other contributors.